Competing Teams in 1987 Beagle Bay, Towns, Saints, Bardi, Roos, Derby, Meatworks. 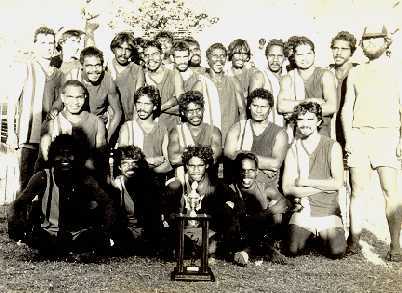 The Bardi Sharks capped off a dream debut year by winning the Broome Football Association's 1987 Premiership, defeating Beagle Bay side by 33 points. The wins was a just reward for Bardi, who led the competition all year, displaying extraordinary skills as well as a single-minded purpose. All year they were first to the ball and played the ball unremittingly, qualities no other displayed consistently. For such a young side it is a credit to themselves and their coach, Alan Bishop, that they showed more experienced sides how attitude and endeavour can secure a premiership. FIRST QUARTER: This was a very even opening quarter, with both sides showing sings of nerves. Justin Sampi (Bardi) scored the first goal at the five minute mark, however after receiving a very crude tackle Pius Gregory goaled for the Bay minutes later. Team-mate Terry Cox then displayed his range of skill to cut loose and kick two goals within two minutes. The first was the result of some hard work in the pack by James Dann, the second came from his brother Eddie who was starting to dominate his wing. Bardi steadied through goals from Mitchell Tigan and Kevin Ejai to finish the quarter one point down. Chris Sampi had the chance to put Bardi ahead at the 19 and 21 minute mark, bout one poster and one easy miss let Beagle Bay off the hook. The duel between Sampi and Albert Dann was enthralling with both players dragging down big marks and using their big frames to advantage. It was a one point lead to the Bay at the end of the quarter. SECOND QUARTER: Bardi kicked to the Chinatown end in this quarter and had the same difficulty in kicking goals that Beagle Bay encountered in the first quarter. The strong cross breeze always prevalent finals time, was blowing. Perhaps inexperience saw Bardi push the ball onto the dead flank all the time. Conversely, Beagle Bay, mainly through the agency of Howard, were directing the ball across the centre the better, but failing to gain results. Their first score did not come 'till the 11th minute, when James Dann hit the post, and curiously, Bardi's first score at the 4th minute was a poster also. Shadforth, Terry Cox and Gregory, provided the build-up for Beagle Bay's first goals, which came off the boot of Donation. A good lead from James Dann produced the second for the quarter. Bardi equalled these goals with efforts from the brilliant Kevin Ejai and Chris Sampi. Again one point was the margin at half time, Victor came into the play strongly to be one of Beagle Bays's best, along with Howard and Corpus. Michael Carter, although lacking in stature, was outstanding for Bardi and was well supported by Wiggan, Ejai and Sampi. THIRD QUARTER: Bardi gained the ascendancy in this quarter, kicking 4 goals 1 point to shoot to a 15 point lead, whilst Beagle Bay suffered the horrors of the Chinatown end again, contributing one goal five points for the quarter. Reggie Thomas opened the scoring for Bardi at the five minute mark, this being the first of his five goals for the game. Beagle Bay replied a minute later, with Keith Kitchener making Bardi pay the full penalty for a bad mistake. Ejai drilled another one for Bardi a minute later, and then Reggie Thomas made amends for an easy miss with another and Bardi were rolling. In one of the plays of the day Kevin Ejai displayed all his skill and tenacity to run the ball forward and drill the ball to Sampi, who did not miss. Bardi went in the break looking slightly better than Beagle Bay, Reggie Thomas, Ejai, Carter and their hard working ruckman Isaacs were Bardi's best for Beagle Bay, best players were harder to pick, but Victor tried hard, as did James Dann, Albert Dann and Laurie Donation. FOURTH QUARTER: Bardi's coach, Alan Bishop, asked his players to use the long ball, down the centre and to be the first to the ball. They did not let him down, Beagle Bay Coach, Peter Marshall, rang the changes, but despite Beagle Bay having their most productive quarter of the game (3 goals 1 point) they could not match Bardi's six goal effort.The quarter started at a frantic pace. In the 2nd minute Reggie Thomas scored for Bardi, in the 5th, Dann for Beagle Bay. When Thomas struck again in the 8th minute, followed by Ejai in the seventh, the game looked to have been tipped. Beagle Bay were not to be denied, and Gregory showed them the easy way home, then Dann punished a foolish free kick in the 13th minute and the game was still on. The Bardi coach then indicated to the crowd, his players and the heavens above that he needed an answering goal, it came from the boot of Stanley Ozies one minute later. Beagle Bay could not score. Again in the quarter and after Justin Sampi goaled in the 19th minute,it was fitting that Reggie Thomas, the man who did the damage, kicked the last goal of the game. Reggie Thomas was adjudged man of the by umpires Ron Buckey and Brian Kane. The umpires controlled the game well, Buckey with the ease of a veteran and Brian Kane with surprising coolness for a person who had this honour thrust upon him an hour before the game. The job was helped by the way in which the teams played the game. Umpire Buckey noted that it was very rare to see both sides link arms and cheer each other after the game. This attitude complimented by the hospitality shown the umpires at the Bardi celebrations, should ensure Umpire Buckey returns next year. Bardi have not had the easiest years, one incident involving misbehaviour by their spectators causing some sectors to call for their ejection from the Association. By their actions on and off the field, they have answered their critics an set themselves high standards to maintain in 1988. For Beagle Bay, all is not despondent. No doubt they will lose some of their older players, but the brilliance of their younger players, coupled with the experience of playing in the finals should see them back on the oval for the finals to the 1988 season. Goal Kickers Bardi: R. Thomas 5, K. Ejai 4, J. Sampi 2, C. Sampi 2, S. Ozies 1, M. Tigan 1. Beagle Bay: J. Dann 3, P. Gregory 2, T. Cox 2, K. Kitchener 1, L. Donation 1. BEST PLAYERS: Bardi: R. Thomas, K. Ejai, R. Wiggan, M. Carter, C. Sampi, J. Isaacs, J. Sampi. Beagle Bay: B. Victor, T. Cox, J. Howard, H. Shadforth, J. Dann, A. Dann, P. Gregory.